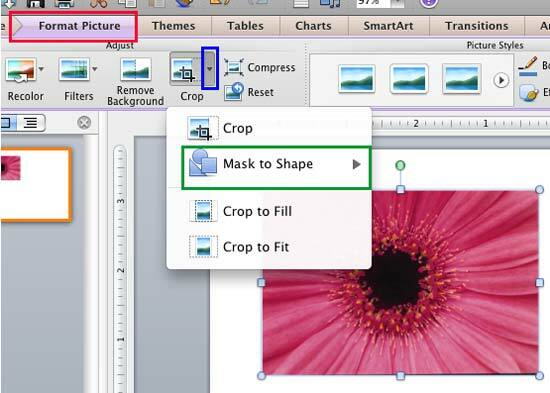 You already learned how to play with all the different Crop options in PowerPoint 2011 -- all except the Mask to Shape option, which we explain in this tutorial. Mask to Shape can be immensely helpful if you want any picture to show contained within a shape. In other words, you start with a conventional, rectangular picture and end up a picture that's not contained within a non-rectangular shape. Figure 1 below shows a conventional rectangular picture towards the left. Both the examples to the right of the original picture have been created using the Mask to Shape option that you will explore in this tutorial. Before youstart, we are assuming you already have a picture inserted on your slide. Select the picture to bring up the Format Picture tab (highlighted in red in Figure 2) of the Ribbon. Activate this contextual tab by clicking on it -- locate the Adjust group, and click the downward pointing arrow in the Crop button (highlighted in blue in Figure 2). This opens the Crop drop-down gallery -- select the Mask to Shape option (highlighted in green in Figure 2, above) to open the Mask to Shape sub-gallery as shown in Figure 3. In the Mask to Shape sub-gallery, select any shape category to open another sub-gallery including several variants of the selected shape type -- click on any shape variant of your choice. In Figure 4, you can see that the 6-Point Star shape within Stars and Banners category is selected. 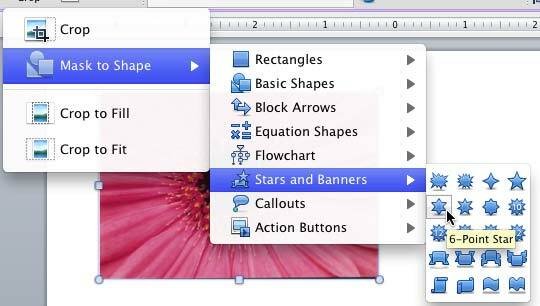 Tip: The Mask to Shape gallery you see in Figure 4 is identical to PowerPoint's Shape gallery. This will crop the selected picture into the shape you have chosen. Just click away from the selected shape once you are done to deselect it. 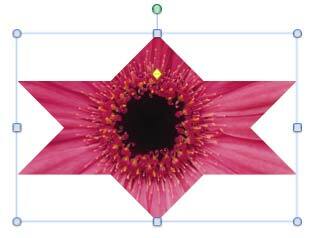 In Figure 5 you can see that the selected picture has been cropped into a six point star. Note: When you apply the Mask to Shape crop option to a picture, the resultant shape may not be proportionate in terms of its height and width. The resultant shape may either be wide or long depending upon the orientation of the inserted picture. 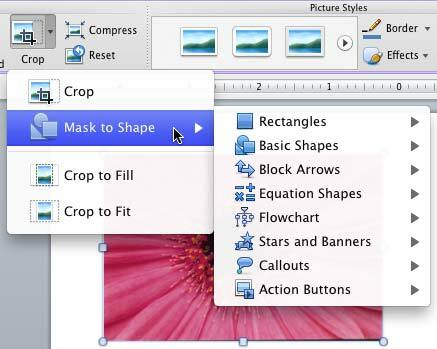 To resize your picture (cropped into a shape) hereafter to your liking, explore our Resizing Shapes in PowerPoint 2011 tutorial. Note: If you apply the Mask to Shape crop option to a picture used a shape fill, you will end up changing the original shape into a new shape.